The most exciting memorable day of your life deserves the best of everything including qaulity flowers. Consultation with flowers by Wendy is highly recommended, as she will exclusively design to your requirements with the utmost attention to detail. Introducing a wedding gallery with stunning real brides wedding flowers. Everyone loves to receive flowers; a gift of flowers can give a positive feeling to someone special that will last for days. To send a floral gift and bring a burst of colour and warm aroma to their home or spoil yourself contact Flowers by Wendy. Funerals are now more personal to a loved one- reflecting something of their life. At such a difficult time Wendy would like to help you choose your floral tribute to express your feelings,and introduces a full range of designs. 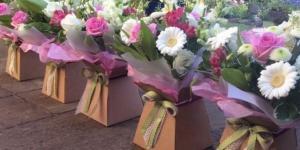 Based in the village of Stogumber Flowers By Wendy delivers to local areas of West Somerset including Taunton, Bridgwater and Minehead and all villages in between. Flowers By Wendy offers a personal floral design service, using fresh all year round flowers from her suppliers and a weekly supply of British Flowers from British Growers as well as growing a small amount of her own. Floral designs are made with a natural relaxed country feel but modern designs are available too. Fully trained in all aspects of floristry and giving a professional service to customers for over 30 years. Wendy specialises in Weddings and Events and shows an extensive gallery of real weddings as well as a huge selection of hired items for families ,photographers or businesses wishing to make there own arrangements or hire for photo shoots. Floral gifts are also made on a daily basis and delivered locally and next day Nationwide delivery available around the UK, also orders taken for Funeral Flowers covering specialist tributes and a wide selection available all delivered to local funeral directors.